One of the most common questions on the python subreddit is something along the lines of “What GUI should I use?” There are no shortage of options but there’s a pretty steep learning curve for many of them. In addition, some work to varying degrees on different platforms and many have been dormant for quite a while. It is not an easy question to answer. In addition to this ecosystem, there are several types of wrapper and helper apps to make development simpler. For example, Gooey is a nice way to leverage argparse to build a WxPython GUI for free. I have had a lot of success using this approach to enable end users to interact with my python scripts. I highly recommend it, especially since wxWindows will now work on python 3.
appJar was developed by an educator, who wanted a simpler GUI creation process for his students. The application provides a wrapper around Tkinter (which ships by default with python) and takes away a lot of the challenging boilerplate of creating an application. The application is under active development. In fact, a new release was made as I pulled this article together. The documentation is extensive and has pretty good examples. It only took me a couple of hours of playing around with the code to get a useful application up and running. I suspect I will use this final application on a frequent basis when I need to pull select pages out of a pdf document. I may also expand it to allow concatenation of multiple documents into a new one. Before I go much further, I want to address Tkinter. I know that Tkinter has a really bad reputation for not looking very modern. However, the newer ttk themes do look much better and I think that the final app looks pretty decent on Windows. On linux, it’s not a work of art, but it does work. At the end of the day, this blog is about helping you create solutions that are quick and powerful and get the job done. If you want a really polished GUI that looks native on your OS, you may need to investigate some of the more full featured options. If you want to get something done quickly, that works; then appJar is worth considering. The goal of this program is to make it quick and easy to take a subset of pages out of a PDF file and save it into a new file. There are many programs that can do this in Windows but I have found that many of the “free” ones have ads or other bloated components. The command line works but sometimes a GUI is much simpler - especially when navigating lots of file paths or trying to explain to less technical users. In order to do the actual PDF manipulation, I’m using the pypdf2 library. The python pdf toolkit ecosystem is kind of confusing but this library seems to have been around a long time and more recently has seen an uptick of activity on github. The other nice aspect is that PyPDF2 is covered in Automate The Boring Stuff so there is a body of additional examples out there. The most complicated aspect of the code is splitting up the page_range into a sequential python list of pages to extract. Stack Overflow to the rescue! That is all pretty simple and is yet another example of how powerful python can be when it comes to solving real world problems. The challenge is that this approach is not very useful when you want to let other people interact with it. The first step is to install appJar with pip install appjar . The first 3 lines set up the basic structure of the app. I have decided to set useTtk=True because the app looks a little better when this is enabled. The downsides are that Ttj is still in beta but for this simple app, it works well for me. I also chose to set the theme to default in this article. On a Windows system, I set it to ‘vista’ which looks better in my opinion. If you want to see all the themes available on a system use app.getTtkThemes() and experiment with those values. 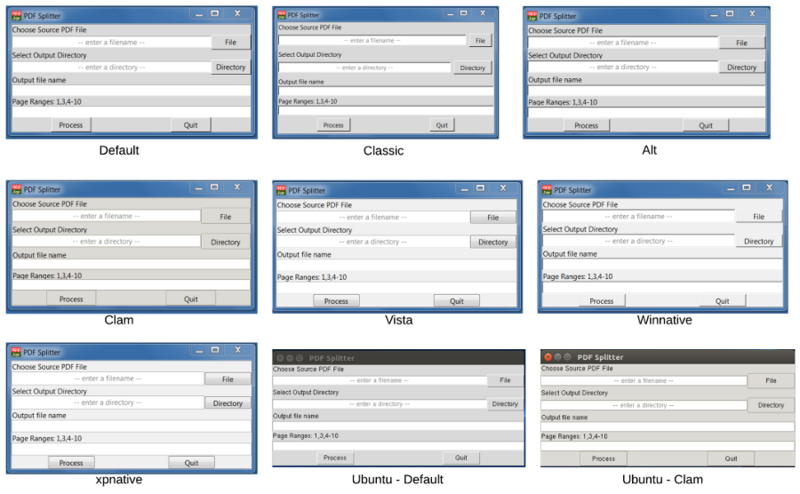 Here is a summary of how the different themes look on Windows and Ubuntu. For this application, I chose to explicitly call out the Label, then the Entry. appJar also support a combined widget called LabelEntry which puts everything on one line. In my experience, the choice comes down to ascetics so play around with the options and see which ones look good in your application. The most important thing to remember at this point is that the text enclosed in the Entry variables will be used to get the actual value entered. This basic structure accomplishes most of the GUI work. 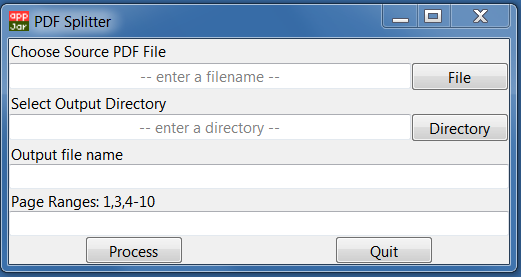 Now, the program needs to read in any input, validate it and execute the PDF splitting (similar to the example above). The first function we need to define is press. This function will be called when either of the buttons is pressed. This function takes one parameter, button which will be defined as either “Process” or “Quit”. If the user selects quit, then app.stop() will shut down the app. If the process button is clicked, then the input values are retrieved using app.getEntry() . Each value is stored and then validated by calling the validate_inputs function. If there are errors, we can display them using a popup box - app.errorBox . If there are no errors, we can split the file up using split_pages . Let’s look at the validate_inputs function. This function executes a couple of checks to make sure there is data in the fields and that it is valid. I do not claim this will stop all errors but it does give you an idea of how to check everything and how to collect errors in a list. Now that all the data is collected and validated, we can call the split function to process the input file and create an output file with a subset of the data. This function introduces a couple of additional appJar concepts. First, the app.InfoBox is used to let the user know when they enter a range that includes more pages than in the document. I have made the decision to just process through the end of the file and let the user know. Once that file is saved, the program uses the app.questionBox to ask the user if they want to continue or not. If so, then we use app.stop() to gracefully exit. Experienced python users are not afraid of using the command line to control their applications. However, there are many times when it is useful to have a simple GUI on the front end of the application. In the python world, there are many options for creating a GUI. This article has shown that it is relatively simple to create a GUI using appJar that will run on multiple systems and provide an intuitive way for users to interact with a python program. In addition, appJar has many other features that can be incorporated in more complex applications. I hope this example has given you some ideas that you can use for your own apps. I also think this particular app is handy and hope a few people might find it useful as well. It should also serve as a good starting point for other PDF manipulation tools.